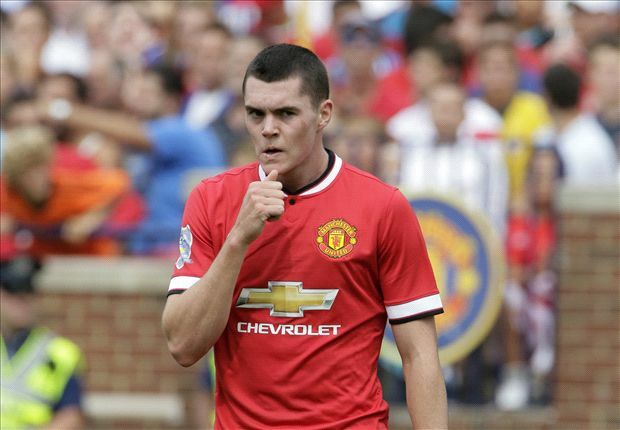 Former United and current Burnley defender Michael Keane has been drafted in to Gareth Southgate's England squad to replace the injured Glen Johnson. Johnson's withdrawal means that Spurs Kyle Walker is the only specialist right-back in the squad following Nathaniel Clyne's injury. Keane has played for the national side at under-19, under-20 and under-21 level and will now join up with the rest of the squad- including current Reds Chris Smalling, Wayne Rooney, Marcus Rashford and Jesse Lingard- at St George's Park. He proved a key man in the Turf Moor outfit's promotion to the top flight last term and has started all of their Premier League matches so far this season. The Stockport-born centre-back moved to Burnley in 2014 after he signed professional forms at United in 2011 and his debut came later that year in a League Cup tie at Aldershot. He was an unused substitute in the FA Cup fourth round defeat at Liverpool (1-2) in the 2011/12 season but a full United debut came early the following term in a League Cup tie with Newcastle. Keane started alongside fellow Academy graduate Scott Wootton in the 2-1 win at Old Trafford and went on to earn the club's prestigious Denzil Haroun Reserve Player of the Year award that same season (Jesse Lingard was second and Larnell Cole third). He went on to make one more appearance for United, replacing the injured Chris Smalling shortly before half-time in a 1-1 draw at Sunderland in the League in 2014. Loan spells at Leicester, Derby and Blackburn were to follow but, by then, Keane had already earned international honours at youth level. He made his debut for Noel Blake's England Under-19 side in May 2012 in a 5-0 win over Slovenia during which his brother Will (also ex-United but now at Mike Phelan's Hull) scored twice. He made the step up to the Under-21s in 2013, replacing Andre Wisdom in a 4-0 win over Austria at Brighton on his debut before scoring in successive Euro 2015 qualifying games against Finland (3-0) and San Marino (9-0). In September 2014, Keane joined Burnley, initially on a loan move until the deal became permanent in January 2015. Elsewhere, United midfield man Ander Herrera looks set to earn a first Spain cap after being named in their senior squad for World Cup qualifiers against Italy and Albania. Herrera represented Spain at the 2012 Olympics and has been capped numerous times at Under-20 and Under-21 level but now has the chance for a well deserved full debut under Julen Lopetegui. Good luck to all Reds past and present who will be representing their countries this week.